This week, adm’s Insight and Innovation team attended Mad//Fest, the largest marketing, advertising and disruptive tech festival in the UK. With two days’ worth of talks and more than 2,000 major brands, media players and emerging disruptors in attendance, the event served to reaffirm the role of marketing as a primary driver of business and identified some of the latest trends: tech-based innovation, personalisation and the importance of authenticity. Deemed essential for outsmarting competition and future-proofing companies, the crucial role of tech-based innovation was emphasised by many of Mad//Fest’s keynote speakers. Both Dominos and Deliveroo outlined how tapping into the latest GPS-tracking technology – thereby ensuring that customers receive the most detailed, up-to-date information on the whereabouts of their food – has given them the competitive edge. Diageo, in recognition of the increasing potential of voice technology, has developed voice-based tasting and cocktail-making tools, recently launching the world’s first voice-based sampling campaign which saw Baileys Almande liqueur samples redeemed via voice assistants such as Alexa and Cortana. Another brand tapping into tech-based innovation is Walkers, whose Max Strong Connected Beer Tap campaign was on display at Mad//Fest. After purchasing a packet of crisps from Walkers’ new, spicy Max Strong range, delegates were invited to scan crisp packets to unlock a particular tap, thereby pouring themselves the pint of beer most suited to their flavour of crisp. In a different example of tech-based innovation, Malibu’s Coconut Cup enables drinkers to re-order with a simple twist of the base of their cup, sending a message to bartenders that another drink is required. Personalisation was highlighted as a second significant trend by numerous Mad//Fest speakers. Many brands recognise the benefits of personalisation while also acknowledging that attempts to ‘connect’ with consumers can be perceived as impersonal and, in some cases, even creepy (think personalised ads which include your name). Fortunately, personalisation-led data is getting smarter and speakers from Deliveroo and notonthehighstreet both emphasised ways in which brands could potentially utilise this. Knowledge of a consumer’s sense of humour, recent life-changing events or even Spotify playlists means that ad content, emails and product promotion could be tailor-made to suit increasingly specific customer preferences. Mad//Fest speakers repeatedly flagged up a third trend: the importance of authenticity in successful brand management. Thomas Kolster, media strategist and author of ‘Goodvertising’, explained how authenticity is as important to a brand’s larger purpose as it is to a one-off advertising campaign. In an era of uncertainty and fake news, consumers are quick to detect a lack of authenticity in marketing campaigns, as evidenced by the negative response to Lynx’s unconvincing ‘world peace’ advertisement. Successful brands, such as Nike, are building brand-loyalty as well as a better society by genuinely exercising corporate social responsibility and by focusing on offering solutions to complex issues, such as sustainable consumption and climate change. Kolster stressed that it is due to authenticity that start-ups are often able to disrupt ‘the big dogs’ (or ‘sleeping giants’). Indeed, a start-up’s genuine purpose is preferred by consumers over bigger, inauthentic brands. 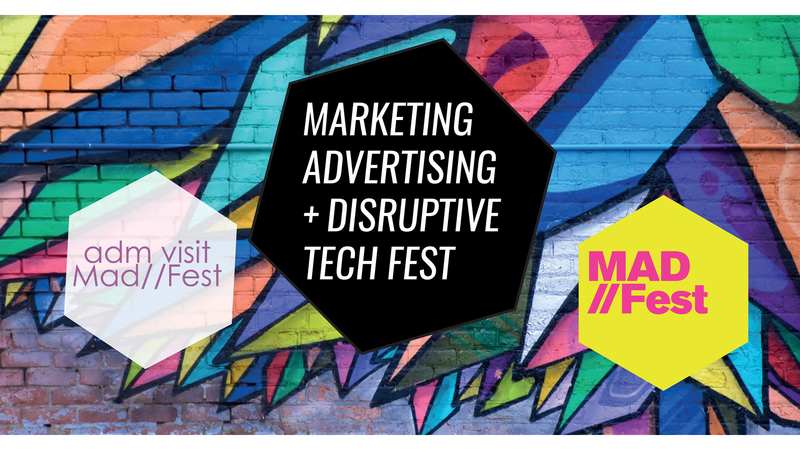 In an age of unprecedented disruption, Mad//Fest served to celebrate innovation and provided enormous insight into the latest trends in marketing, advertising and disruptive tech. Highlighting the importance of tech-based innovation, personalisation and authenticity, the event was a hub of creativity and culture and we look forward to attending next year!